St. Augustine Beach is one of Florida's most beautiful beaches. The beach is very wide, powdery white, sandy and gorgeous. The local atmosphere is casual, laid back and distinctively old Florida. St Augustine's Historic Distict, The Old City, is just 10 minutes away. Surf and Sand OceanFront Beach Rental, located "on the sand" in the heart of St. Augustine Beach and is the perfect beach house rental for large extended families or a group of friends. Our guests absolutely love our location, size and price. Surf and Sand OceanFront Beach Rental is your oceanfront home in the best location in all of St. Augustine Beach. Restaurants, music, surfboard and bike rentals, all are within a block or two. You will LOVE this house and this location! Surf and Sand OceanFront Beach Rental is a 4 bedroom, 4 bath oceanfront house that is a two unit duplex only available for use as one large rental Sleeping up to 10, our guests love this cute and cozy oceanfront St. Augustine beach house "on the sand". Surf and Sand OceanFront is particularly perfect for multi-families. Combined it has 4 bedrooms, 4 bathrooms, 2 separate living areas, 2 kitchens, 2 dining areas, 2 huge oceanfront decks. Each side has 2 bedrooms, 2 baths, kitchen, living and dining areas and 2 oceanfront decks. Our guests love being all together yet having room to escape for some alone time. Best of all, Surf and Sand OceanFront Beach Rental is located in the absolute heart of St Augustine Beach, just 10 minutes from the Historic District! Wake up to the sounds of the ocean, have breakfast either of the oceanfront decks, then enjoy St. Augustine's best beach. Take a sunrise stroll, play in the waves, learn to surf or just work on your tan. Later you can relax in your own little nook of the house while the kids and other family members watch DVDs, have snacks or play games in one of the family rooms or the lower oceanfront dune deck. Enjoy drinks and hors'deuvres on the second floor panoramic deck while the evening breeze moves in. You may hear music drifting by from a nearby band. 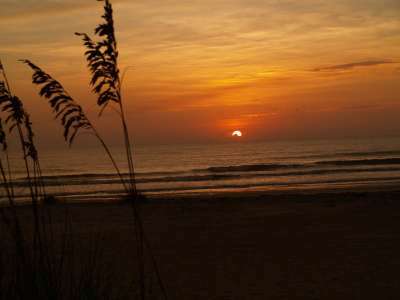 This beautiful St. Augustine Beach sunrise was photographed by one of our beach house guests. Evening is a great time to walk to a quaint beach bar and grill or take a short drive to St. Augustine for upscale or casual dining. Stroll through the historic district where you'll find local musicians and a cool drink in small bars tucked away throughout the cobblestone streets. Sightseeing, eclectic shops, artists, horse drawn buggy rides, a local winery, and museums make for activities for everyone's taste. The more adventurous will enjoy various ghost tours or a sail around Matanzas Bay! 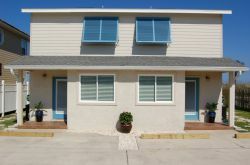 Surf and Sand OceanFront Beach Rental in St. Augustine Beach is the perfect blend of size, location and price!